One of my favorite fashionistas (and dear friend) is throwing a soiree. 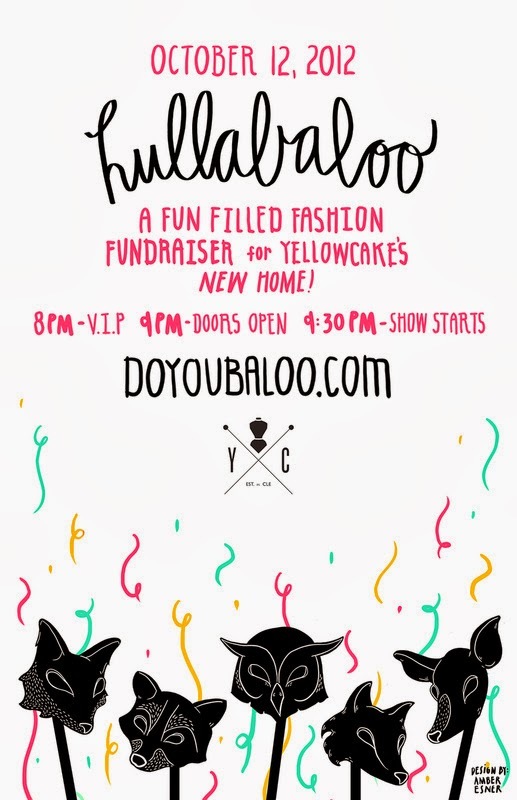 Valerie Mayen, Yellowcake designer and Project Runway alum, is hosting Hullabaloo on Friday, October 12th. You won't want to miss this magnificent evening filled with fashion, cocktails and woodland creatures. General Admission: $15 (before 9/20) $20 (after 9/20) $25 at the door - Runway show, appetizers, cash bar, candy bar, open access to silent auction packages and garments. VIP: $75 (before 9/20) $85 (after 9/20) $100 at the door - complimentary cocktails, appetizers, pre-show meet and greet with the designer including a preview of the runway show looks, signed sketch print from the collection, first chance bidding on silent auction items and an opportunity to win a garment from the Yellowcake store. Not only will there be a splendid runway show but a candy bar, rock candy cocktails and live orchestral indie and modern rock music, a Yellowcake photo booth and ,of course, a post show dance party. I have a VIP ticket to give away to one lucky reader! 2. Tweet: "I want to be a Yellowcake VIP at Hullabaloo with @smittenincle! http://ow.ly/dxBae "
3. Comment on this post telling me what your favorite kind of cake is. Please leave a comment below on this post for each entry to be counted. Contest closes Thursday 9/13 at midnight and a winner will be announced Fri 9/14. Stop in to the YellowcakeShop at 6500 Detroit ave before September 20th and score some tickets just by shopping! Purchases over $195 in store earns you one VIP ticket, while purchases over $100 earns you one general admission ticket. A sneak peek of some of the new collection. I had the opportunity to try some of these on and fell head-over-heels in love. edition Hullabaloo merchandise, handmade Yellowcake totes and more. Some of the sketches from the new collection. ::Disclosure - I was more than delighted when Valerie asked me to do a giveaway on my blog. I was also offered VIP tickets to attend and heartbroken when I had to decline due to scheduling conflicts. Looks like so much fun! So sad I can't enter! Italian Cassada Cake, strawberries and cream, delish!!!!!!! Ohhhhhhh! I love Yellowcake! I have some earrings of hers I bought at the Tremont Arts and Culture Festival last year and I wear them at least once a week. My favorite cake is Red Velvet! Favorite cake? Vanilla with chocolate ganache frosting. I'm such a huge fan of Val's and LOVE LOVE LOVE her minicake line for my daughter. Cute and affordable! Hmm, my favorite cake might be lemon with raspberry curd filling and lemon buttercream. My least fav is red velvet, I just don't get the obsession. All cake is good cake as long as it's homemade! I love carrot cake or that yellow cake w/ pineapple and whipped cream frosting. so good! My favorite cake is Yellowcake - with fudge frosting. Or carrot cake with a good cream cheese frosting. Or cheesecake with a cherry topping. Oh, I just like cake. and... i love grocery store-bought cake. that sugary sweet thick icing that stains your mouth? plus the sprinkles? too much for this girl to resist. Is there a type of cake I DON'T like!? LOL But my all-time favorite is a 13 layer Dobosh Torte -- heavenly!! Living in Cleveland furnishes an all access pass to food, art and fashion and YellowCake blends these Mah-velously Dah-ling!! Bakers Bakery date and nut...the best! Photobooth Rental Yorkshire is a party photo booth, fully delivered, set up and hosted by our booth team ideal for photographing your guests at Wedding receptiions, Proms, BIrthdays, Christmas parties or any other type of Celebration.